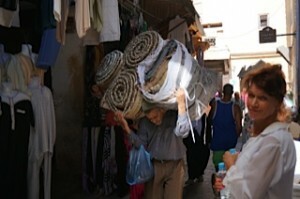 "…very glad we choose to visit Morocco…"
We are just returned from our trip. Although we travelled London to Morocco to Portugal and Spain, it was Morocco which we would have missed out on most of all if we had not been there. Without doubt our Riad Myra stay was the highlight together with the Kasbah in Rabat, the Medina in Fes and Hassan Mosque …and the Moroccan food! Hamid, our driver, was a courteous, gentle, respectful and punctual man. All that your company promised unfolded seamlessly… suffice to say we are very glad we chose to visit Morocco with your company.